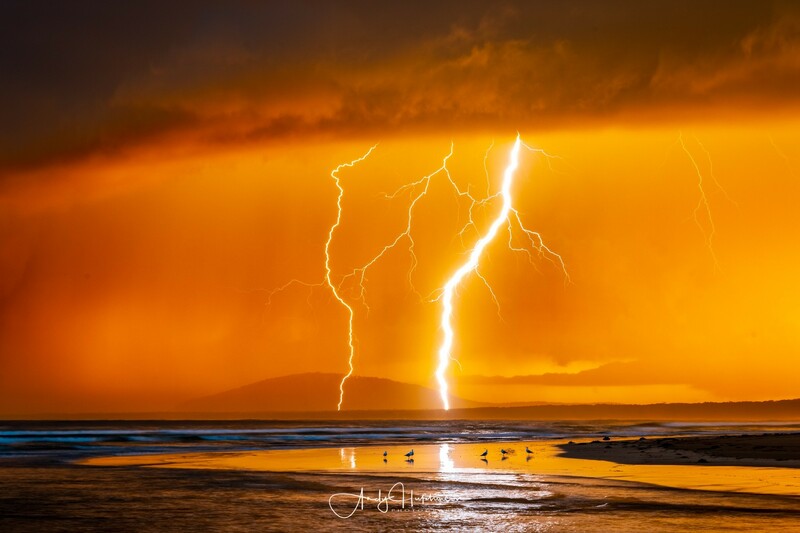 There has been a tonne of interest in my sunset lightning shot – it got picked up and reshared by a load of different social media accounts and channels and consequently there was lots of interest in how I captured the shot. I figured it would make an interesting subject for a blog post and so here I’m going to break down exactly how I got the shot and how you can increase your chances of capturing similar imagery. I certainly wouldn’t consider myself a storm-chaser, but if nature decides to throw a bit of weather in my direction than I’m not averse to going out and photographing it. Consequently I’ve photographed quite a few storms over the years and have arrived at a technique I’m happy with that requires nothing too fancy in terms of either hardware or technique. I make a point of heading out when there’s the best chance of colour or drama. I quite often head to out to photograph the sunset and always check out the clouds before-hand to see if there’s a chance of the setting sun back-lighting. I do this firstly by simply looking out of the window. From my back garden I look south-west and check out the clouds and look for a gap on the horizon which will enable back-lighting. I also look at the type of clouds – high level are best. 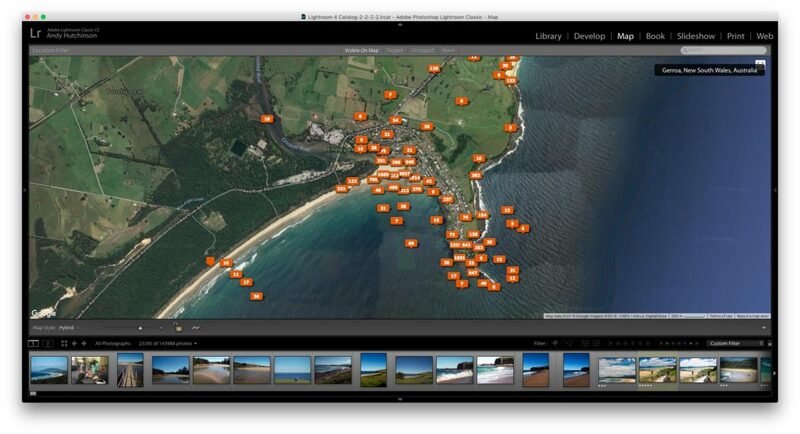 Then I check out the satellite image (using Windy) to see if my assessment of the clouds was correct. Finally I check the weather for the location and see if it’s going to be windy or if we’re due for some precipitation. On the day I took this photo I didn’t have to look at the sky for long to know that it was likely to be a great sunset. 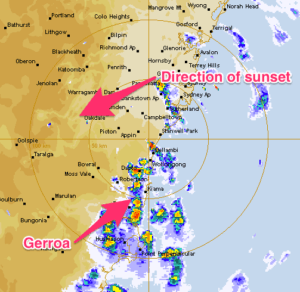 When I then checked the satellite image (which you can see on the left) I saw the line of electrical storms which stretched all the way down from Sydney to Eden. As I was checking my camera equipment I wondered if the sunset would coincide with the arrival of the storm at Gerroa and, as it turned out, it did. In this particular case it was a happy coincidence that the line of electrical storms were making their run out to sea right on sunset at 5pm. However I suspect that a lot of people would have looked at the sky and checked out the forecast and decided not to go out and take photographs. I always try and making a point of heading out when the weather’s bad because that’s often when you get the most dramatic shots. Because I was quite excited by the cloud cover and the impending storm I made sure I was on the beach a good hour before sunset. That gave me plenty of time to consider where I was going to go, to prepare myself and my kit, to find some good tunes to listen to, to make sure I had an SD card and a fully charged battery and to get set-up. The photograph was taken at the very southern end of Seven Mile Beach in the holiday village of Gerroa. This is a location I am extremely familiar with – it’s my go-to sunset spot and I’ve taken over 20,000 photographs there. I keep going back to Gerroa because it’s one of the few places on the east coast where you can photograph the sun setting over the water. The beach here curves back around on itself and the land extends out at Black Head meaning you have lots of options in terms of the location of the sun. It’s also, obviously, a photogenic location and, whatever the time of year, I always find something cool to photograph. There are numerous places to situate yourself on Gerroa to capture great photographs, but in this particular instance, I was standing right next to little Crooked River just in front of the boat ramp. The storm was already very active and I didn’t want to get too far onto the beach and leave myself without an escape route should things get too crazy with the electrical activity. I also knew that rain was coming and, while my camera is weatherproof, none of my lenses are, so I needed to know I could get under cover quickly when the rain front hit. The bottom line is that this was a place I knew extremely well and, having solid knowledge of the location was instrumental in capturing the shot. If I had gone to a location I wasn’t so familiar with I would be playing a guessing game, working out where best to position the camera. Once I was set up on the beach and had the camera on the tripod I composed my image to include the seabirds on the low-tide sand bar. I check the hyperfocal distance for my chosen aperture, lens and camera in the Photopills app and then focused about 7 metres into the shot. Finally I turned off auto-focus and set the camera running its intervals. The bottom line of storm photography is that you should aim to have your shutter open for as long as possible. I’m not talking about very long exposures (although they’re fine too) but the frequency of shots. Every time your camera’s shutter closes there is a chance an amazing bolt of lightning will strike and you’ll miss it. One of the ways to avoid this (and to keep from hitting the shutter button) is to use an interval timer. My camera (a Canon 7D Mark II) has an interval timer built in but you can buy an intervalometer for next-to-nothing (around $12) to use with pretty much any DSLR. Obviously you’ll want to put your camera on a tripod too and, since you’ll probably be shooting fairly long exposures you should make sure it is as stable as possible. There are devices you can buy that detect lightning and fire the shutter automatically and I’ve heard these work fairly well, but I prefer to keep things as simple (and old school) as possible. 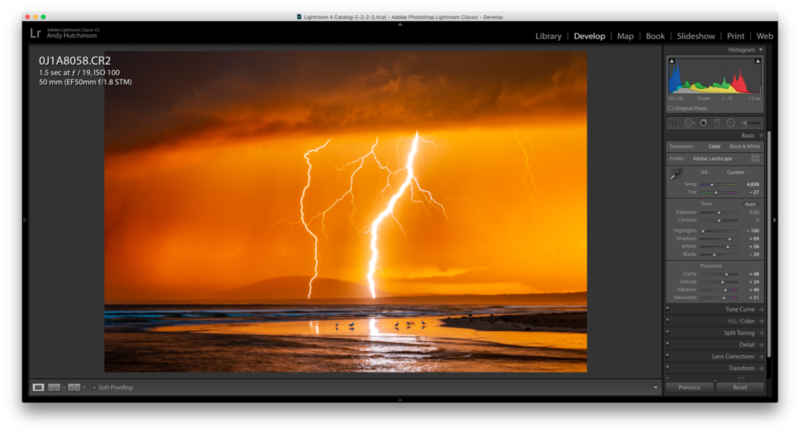 Finding the right image settings is often a case of trial and error because you need to account for the ambient light, the sun and the lightning bolts. In the box on the left you can see the EXIF data for my lightning shot. I was shooting in aperture priority mode because the light is constantly changing and it’s easier to react quicker when you’re just tweaking aperture. 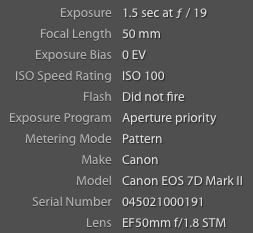 I set the aperture to f/19 because firstly I wanted a crisp shot and secondly I wanted to stretch out the exposure time. In this case, with the available light, the camera exposed the image for 1.5 seconds at f/19. I also kept the ISO as low as possible to reduce the noise levels. The lens I use for 90% of my photographs is the 10-22mm EFS, but as you can see from the EXIF, this shot was taken on my 50mm prime (nifty-fifty) lens. The reason I switched from wide angle to narrow was that I could see the lightning striking in roughly the same area fairly consistently and I knew that I could get a much closer shot with the 50mm. The risk of narrowing your field of view is that you’ll get a bolt off to the left or right of frame, but sometimes you have to take a chance. In this particular instance, these bolts of lightning hit about 30 seconds after I switched to the 50mm. As soon as I saw the image appear on the screen on the back of the camera, I knew it was a keeper. I carried on with the 50mm until the storm was upon me and then I switched back to the wide angle lens for the subsequent shots I captured as the storm headed out to sea. I take a lot of bracketed shots and often combine them in Lightroom or Photoshop using HDR or tone-mapping techniques, but this particular photo is one single RAW shot, processed in Lightroom. In terms of sliders, you can see what I did to the shot in the screenshot on the right. Highlights dropped to better define the lightning along with a bit of dehaze to make the lightning sit proud of the cloudy background. Everything else is fairly standard for a RAW shot. Other tweaks were some targetted sharpening to just the edges of the lightning in the Detail tab and a small vignette in the Effects tab to draw the eye inwards. I made no changes to Tone Curve, HSL/Color, Split Toning or Calibration tabs. I’ve often found that the best images are the ones that don’t need a massive amount of tweaking and that was certainly the case with this shot, to which I applied my usual baseline RAW tweaks. The fact that I shot the image on my 50mm lens made a huge difference to image quality – it’s such a high quality lens that good images just seem to fall out of the camera. Thinking back to the evening of this storm I wondered if I would have done anything differently and the truth is that I wouldn’t. I had about 25 minutes on the beach before the storm got to me and I captured some great shots in that timeframe and even shot some video. I was pleased with the way I set up, I was pleased with the composition I chose and I was pleased with the results. If you’d like to see some of the other photos I took that night then check out my blog post which has another 12 shots in it.